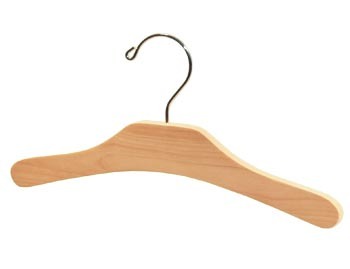 Our selection of Children's Wooden Hangers are available in a 12" hanger size that fits most child and junior sized clothing. They also come in a smaller 10" length that make them perfect for baby, toddler and infant clothes. We use only natural US maple woods for our kids closet hangers. Hanger Store also offers Kids Wood Hangers with Clips and Custom Childrens Hangers. First, clothing best keeps its shape when it's hung on a sturdy, quality hanger. 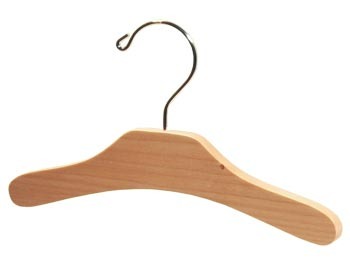 Second, wood hangers don't leach any harsh chemicals or rust onto clothes that touch your child's skin. Hangers made from plastic may contain toxic components. Metal hangers are flimsy and bend out of shape easily and can rust onto the clothes in high-moisture areas. Our high-quality wooden children's hangers are the same hangers we sell to children's clothing shops. All our hangers are "commercial grade," so you know that you're investing in the sturdiest and longest-lasting hangers. Parents who use wooden hangers at home, help their children learn to take care of their clothes and keep them looking nice. Our children's clothing hangers come in two sizes to grow with your children's clothes, from babies and toddlers to juniors. They help keep clothes fresh and wrinkle-free. Clothes hanging neatly organized in your children's closets will last longer because they hang evenly spaced, keeping them from snagging, rubbing or catching on each other. Having an organized closet and an outfit hanging and ready to go the next morning can save everyone's sanity and significantly lower the stress level for everyone involved. Every parent knows the frustration of trying to get everyone out of the house in the morning on time. The biggest obstacle to doing that is when kids are overwhelmed and can't or won't get dressed on time. Whether it's a big pile of toys to put away or a big closet-full of clothes to sort through, it is overwhelming for them to know where to start. Instead, they shut down or have a tantrum. Even adults panic with clutter. Investing in wood hangers keeps everyone happy. Give them as gifts for new parents, too! We're here to help make your life calmer and more organized. Contact our team at Hanger Store for ideas about how to best use wooden children's hangers for your kids and as gifts and for crafts.